You’re on your way to the city for a fun night out, when the bus driver abruptly swerves to the side of the road and comes to a complete stop on the shoulder of the highway. Peering out of the window to see what just happened, you notice that two of the bus tires have completely lost their form. The good news is that this isn’t the bus driver’s first go-around. The moment that the bus was securely stopped on the side of the road, the bus driver placed a call to our Atlas Towing team—and we’re already on our way. 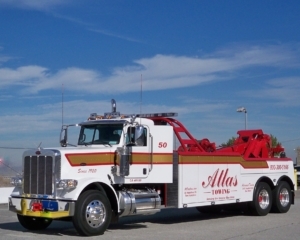 Powerful and large in size, heavy-duty tow trucks are equipped with the pulling power and amplified recovery system that’s necessary to successfully provide help in even the most demanding recovery situations—from rollovers, to high centers (e.g., bottoming out), to accidents. Heavy-duty tow trucks are equipped with under-reach and wheel-lift technology, making them proficient at providing high-powered, damage-free towing. This distinct technique begins by lifting from the axle or tires of the large vehicle. The front end of the vehicle is then lifted in the air, until the back two tires are the only part of the vehicle that remain in contact with the ground. Once the vehicle is indeed secure and prepared for safe transport, it can finally be towed to the client’s desired destination. Which Vehicles are Heavy-Duty Worthy? When you call Atlas for help, you’re not just hiring power; you’re hiring reliability, efficiency, and a team of experts that genuinely care. The true strength of our heavy-duty trucks delves deeper than just the physical power that our trucks carry. It lies within our team’s relentless passion to provide individualized assistance to each customer in a timely manner. 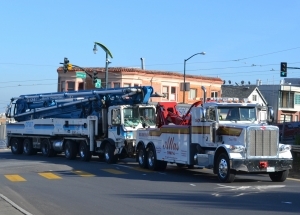 The size and strength of our heavy-duty tow trucks creates an optimal opportunity for our company to exceed customers’ expectations by providing multipurpose usage capabilities: towing multiple vehicles simultaneously for a more cost-efficient and quicker towing technique, and offering companies assistance in the transportation of their heavy or specialty-built equipment. When you need power, the Atlas team has the strength. Contact us at 800.300.5166 today, and we’ll be on our way!